The use of materials that are fully compatible with living cells may be the most reasonable plan for producing artificial models of cells. In this contribution, we present the results of some recent studies toward the construction of artificial cells, and explain methods for emulating several important specific functions of real cells in artificial liposomes. We discuss several aspects of the current experimental approaches, from the optimal construction of giant vesicles (GVs) to the realization of complex vesicle-based molecular system. The entrapment of DNA and enzymes inside GVs are discussed, as well as the synthesis of water soluble proteins inside vesicles. Emphasis is given on the new approaches to synthesize membrane-soluble proteins on the vesicle membrane. The case of connexin 43 (Cx43)-containing liposomes is described in details, as well as the extension of the proteoliposome technology to giant lipsomes, suitable for direct microscopy imaging. 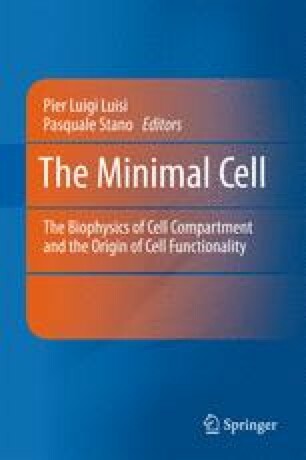 Application of the current in vitro synthetic approaches to the study of cell morphology is also discussed, by referring to the partial reconstitution of cytoskeleton inside GVs. In our recent study, G-actin and BBMI were simultaneously entrapped inside liposomes, through the method of natural swelling, resulting in efficient GV transformation. We conclude with some general consideration about the future work on cell models using vesicles.